I’ve created a new online course specifically for non-profits and charities, on how to make the most of your Google Grant Adwords account. 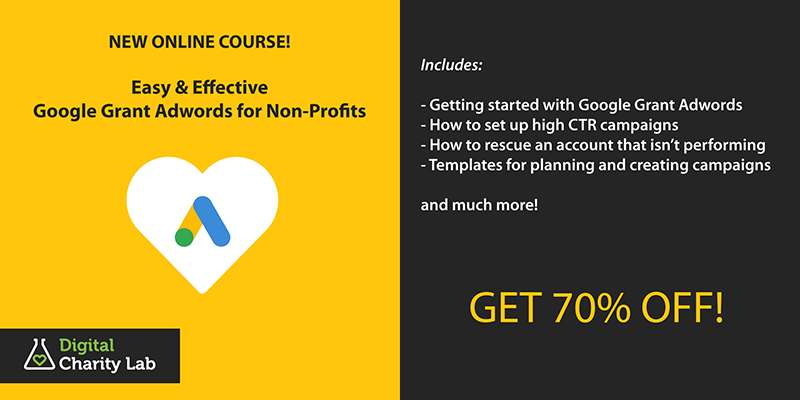 You can get this course with a large discount off the standard price at this link: Easy, Effective Google Grant Adwords for Non-Profits on Udemy.com. Google Grant Adwords is probably the topic for which I get the most requests for help. Google Grant Adwords are a fantastic opportunity for charities – Google provides a very generous grant to all registered charities, giving them up to $10k in free advertising per month; and search ads are one of the most effective digital marketing channels of all. But charities struggle with Adwords, usually because of not having been given proper guidance on how to use the system, and also because Google have set quite stringent minimum level performances for Google Grant Ads.